How to research, plan and organise the ultimate holiday — whether you’re after an island escape, a city break or an adventure. First things first: there’s no such thing as the perfect holiday. However, some trips always stay with you, with each and every memory savoured because it was so damn great. More often than not, these are the trips that are well planned. I’m fortunate that I get to travel a lot for work, however I think that whether you take one trip per year or twenty, the approach to planning a trip is still the same. You need to consider your budget. You don’t want to be rained out. And you don’t want to turn up to your accommodation to find it’s a million miles from anywhere. 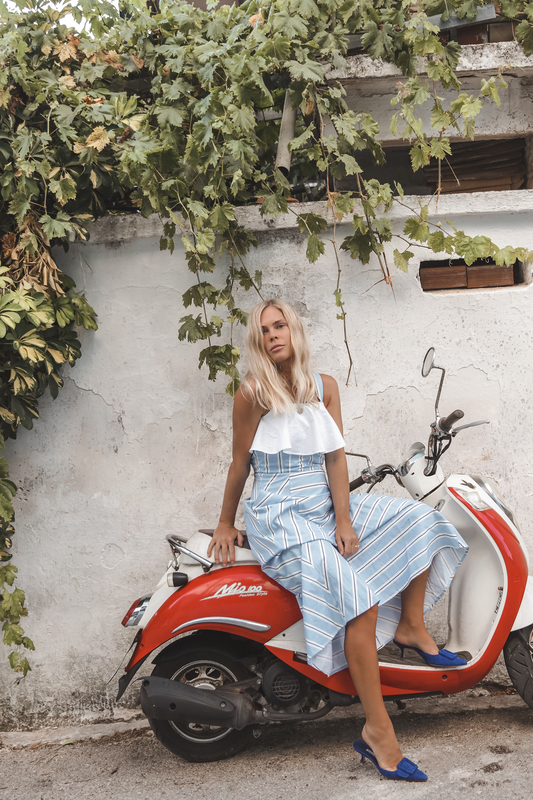 This past week I shot an edit of Reserved’s Riverea collection (aka the perfect clothes for a summer get-away) on the teeny island of Lefkada, a lesser known Greek island populated by mountainous villages and turquoise waters. Our trip throughout the Ionian islands required a hefty amount of planning (on this trip we visited Corfu, Leftkada, Kefalonia and Ithaca), so I wanted to share the low-down on how I actually plan our travel. Full disclosure; I’m a massive research nerd. I’m a big believer in the idea that the planning and anticipation of travel should be part of the adventure. Most of our trips – both for work and pleasure – are planned around tips and advice from locals, and that always requires a fair amount of digging (aka research). First things first. Are you in desperate need of sunshine? Or do you want to use this opportunity to go somewhere new and experience a different culture? Do you want to avoid long-haul travel? Do you want to go back to somewhere that you visited and loved years ago? We all get something totally different out of travel, whether it’s to be recharged or challenged – so don’t just go to Paris because you think you should. It may sound boring, but if you want your dream holiday, you have to be organised. Start planning before you think you should. Don’t leave things to the last minute. Flights are often a huge expense, so start researching flight options at least several months before you need to book. Sign up to airlines, as well as their newsletters (if you dare) and keep your finger on the pulse for flash sales. When I book a trip, firstly I’ll visit Skyscanner to find out which airlines fly the routes that I want. I then go to the airline’s own websites and explore which dates are cheapest – sometimes you can save hundreds by simply flying a day earlier or later. For longer travel, I also look at a range of stopover destinations; when flying to New Zealand from Europe, for example, sometimes you can stop over in Bangkok for no extra cost (aka an almost-free trip to Thailand). There’s no better knowledge than first-hand knowledge. If you know anyone who actually lives where you’re headed, reach out to them. Or if you know someone who’s recently been (even if it’s a friend of a friend), get in touch. In a time where the world is more connected than ever, I find people are always willing to share their local tips and favourite spots. In our current media-frenzy culture, you run the risk of being over-exposed to images of the ‘perfect’ holiday. We see impressive drone shots, polished Instagram posts, professional photos and curated online galleries; occasionally it’s hard not to be disappointed by reality. Remind yourself of what you find important on holiday; maybe it’s spending time with loved ones, maybe it’s finishing an entire book (or several), maybe it’s visiting a historical building you’ve always been interested in or maybe it’s simply eating an authentic bowl of pasta. Just because someone else’s trip looked more impressive than yours doesn’t mean it was. Don’t bother with comparison; it’ll just make you unhappy. Set a budget. For everything. Not only is setting a budget a necessity, it will actually make planning so much easier. How much are you willing to spend on a flight? What’s your budget for nightly accommodation? To set an accurate budget you need to factor in the details. Is luggage included in your flight, or do you need to pay extra? Have you booked somewhere you can reach by public transport, or will it be an expensive taxi ride? Do you arrive at 2am when the trains aren’t running? Is breakfast included? Sometimes a great deal isn’t really as good as it appears; it pays to be a sleuth and look into the details. Tripadvisor et al can be a double edged sword. Yes, it means you can quickly gauge a feel for a place before going. However, the downside is that people are drawn the exact same spots, simply because other reviewers say they liked it. Ask yourself – do you usually leave reviews on Tripadvisor or Google? If the answer is no, then it’s likely you’re a very different traveller to those who leave reviews. So perhaps their favourite restaurant isn’t for you. Despite the fact that Instagram is not, in fact, a true depiction of reality, it can still be a great way to get an insiders’ look at a place before you arrive. Check out the geo-tag of the hotel your thinking of staying to see if the rooms really are as nice as they show on the website. You can even check out the live Instagram Stories (which displays the last 24 hours) of an entire town or city to see if the weather really has been as bad as the reports online say. One thing I’ve learned from travel over the years is that you’ll never know which part of your trip will be the most special. So whilst it’s good to have the majority of the big stuff planned – like flights and accommodation – I like to leave a small portion totally free. For example, if I’m headed to Italy for a week I’ll keep two nights completely unplanned, with no accommodation or anything. That way I can make a plan that just feels right at the time; you never know which area you’ll fall in love with! The plus side of leaving a small amount of planning until the last minute (aside from the fun of spontaneity) is that you can make the most of last-minute hotel deals. Some of the fancier boutique hotels Sam and I have stayed in have all been thanks to last minute deals on sites like Booking.com – many places offer between 40-60% off the standard room rate if you book a day or two out from your stay.